During the Second World War, the British Isles were subjected to a Nazi naval blockade, the aim of which was to disrupt food imports and starve the British people into submission. Shipping, whatever it was carrying, had to get past the German U-boats before it could safely deliver its cargo. Of course, the Allies were also trying to prevent ships from reaching Germany – this was the Battle of the Atlantic. By the end of the war, more than 2,400 British merchant ships had been sunk, with the loss of over 30,000 men. With the pressure on shipping, and the need to bring in munitions and other materials for the war effort, the British government encouraged people to eat more homegrown potatoes and less bread, which was made from imported wheat. 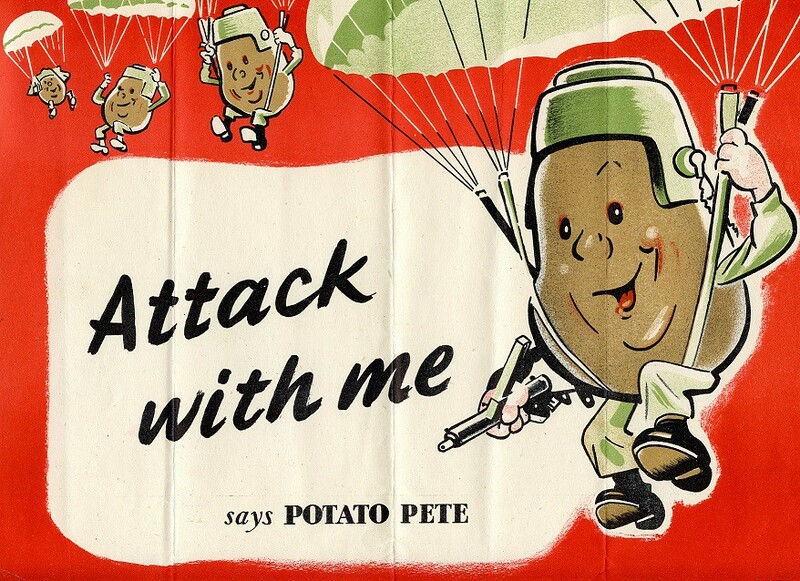 One of the ways they did so was to invent a cartoon character – Potato Pete – who ended up being very popular! 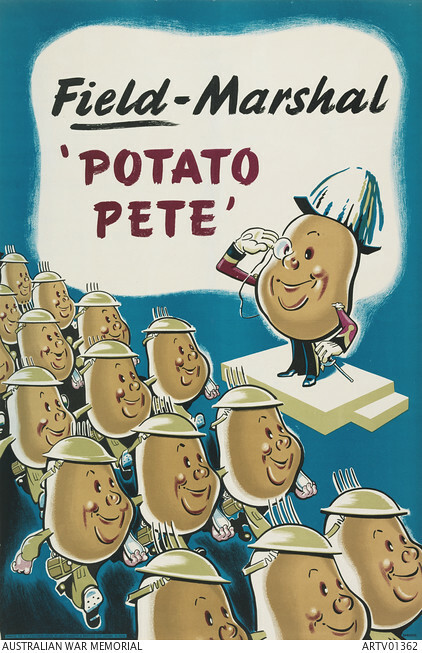 Potato Pete had his own recipe book, published by the Ministry of Food, which you can view online, and unrationed potatoes made it into all kinds of dishes, from pastry and sandwich fillings to desserts. These days, carbohydrates get a bad rap* – they’re accused of fuelling both our expanding waistlines and rising rates of type 2 diabetes. Potato consumption is dropping in the UK, and we’re switching from buying actual potatoes to buying processed potato products. But potatoes are still a mainstay in the vegetable patch, and the easiest way for your garden to produce some carbs. With Brexit looming (or is it? Who knows?) 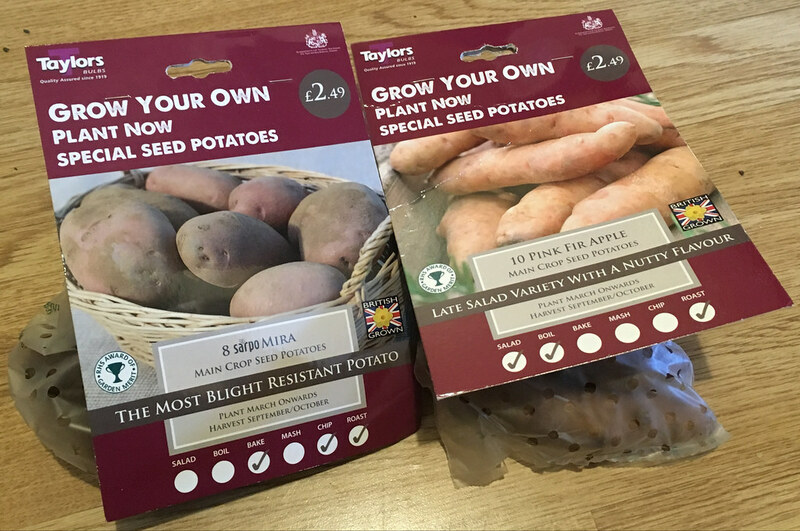 I have included two beds of potatoes in my 2019 garden plan, and I headed out as soon as the seed potatoes arrived in the shops, to make sure I got what I wanted. For the last two years I have grown Sarpo Blue Danube, which has the most beautiful blue flowers, and produces blue-skinned potatoes (on top of being blight-resistant), but they weren’t happy with my laissez-faire approach to watering, and were scabby. Meanwhile, the volunteer Sarpo Mira growing untended in a pile of compost were happy and healthy and produced some big spuds, so I’m going back to growing them as my maincrop this year. I wanted a new potato, but rather than pick up an early variety I chose Pink Fir Apple, which is a maincrop salad potato, and a late one at that. It’s not blight resistant, so if it turns out to be a bad year for blight then I might regret my choice, but if you can manage a good crop then Pink Fir Apple is a lovely potato, with a good flavour. It’s an unusual shape, all knobbly and with eyes, which is much closer to the ancestral potatoes that still grow in the Andes. In July 2008, Tom Sykes set out to spend a week eating nothing but potatoes (although that’s not entirely accurate, as he jazzed them up with store cupboard ingredients, cheese and bacon). By the end of the week, he was eating up to 8lb (3.6kg) of potatoes, but notes that – before the Irish potato famine – an average adult Irishman ate about 13lb (5.9kg) of potatoes every day. Basing your diet around potatoes may sound boring, but as Tom’s entertaining article shows, they are so versatile that – if you have the time to cook – you can have a different, and delicious, potato dish for every meal of the day quite easily. Of course, you’d need more than two beds of potatoes growing in the garden to manage it! The Ministry of Food is gone, but the Potato Council has taken on its ‘marketing’ role, to encourage us to eat more potatoes. In 2015 it decided to celebrate the 70th anniversary of Victory In Europe (VE Day) by bringing a few of those Potato Pete recipes up to date – Woolton Pie, Oxford Potato Soup, Scotch Hotpot, Sole Otero and Potato Piglets. If you fancy trying them out, I’ve posted the recipes in my new Home Front Community – I’d love for you to come and join me there for a chat! And if you’re worried about Brexit (or other upheavals) and thinking about growing some of your own food this year, check out my new zine – Keep Calm and Grow Food– which is available via Etsy.